Parameter query is one of the easiest and most helpful questions you can make. Since parameter questions are so straightforward, they can be effortlessly refreshed to mirror a new search term. When you open a parameter inquiry, Access will provoke you for a pursuit term and show you question comes about that mirror your hunt. When you’re running parameter questions, seek terms act as variable criteria, which are inquiry criteria that change each time you run the inquiry. For example, suppose we claim a pastry kitchen and need to make a question that will rapidly look into orders that were put on a specific date. 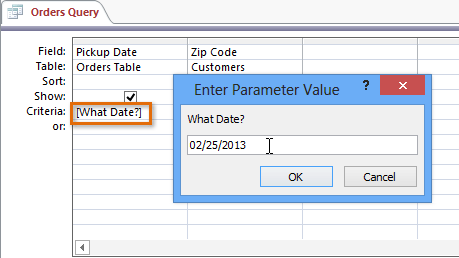 We could make a parameter inquiry with variable criteria in the Date field. Along these lines, each time we run the question an exchange box will seem to provoke us to enter the date we’d like our inquiry to look for. We’ll enter the date we want, then Access will run the query using the date we entered as a search term. Make a question as you typically would, changing the table joins if important, choosing the fields to incorporate into your inquiry, and adding any variable criteria to the fitting fields in the Criteria: row.Find the field or fields where you need the variable criteria to show up, at that point select the Criteria: row. Sort the expression you need to show up in the provoke that will fly up each time you run your inquiry. Make a point to encase the expression in brackets [ ]. For instance, in our parameter question that scans for orders put on a specific date, we may type our criteria like this: [What Date?]. On the Design tab, click the Run command to run your inquiry. An exchange box will show up with the predetermined incite. Enter your hunt term and click OK to see your question comes about. 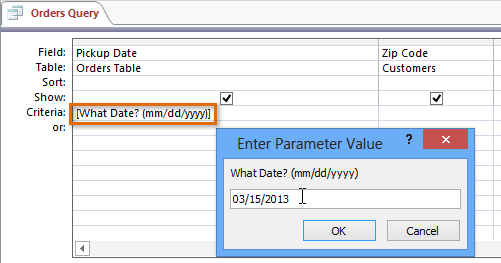 You can simply open an existing parameter query to run it. In a perfect world, they provoke you to make for your inquiry should make it clear what type of data the hunting term ought to be, and in addition the desired format. For instance, to ensure clients enter a look for a date in the configuration utilized as a part of our database, we could compose the accompanying in the Criteria: a row of the Pickup Date field like this: [What Date? (mm/dd/yyyy)]. The least difficult parameter question will give you a correct match criterion, which means the inquiry will scan for the exact text you enter in the incite. Nonetheless, you can transform any sort of criteria into variable criteria. Basically, type your provoke message in sections in the piece of the criteria where you would ordinarily put an inquiry term.For instance, in an ordinary question, we could discover orders that were placed between two dates by utilizing the criteria Between x AND y and replacing x and y with the first and second dates, separately. To transform this into a parameter criteria, we would just supplant the x and y with the content we need to show up in the incite. 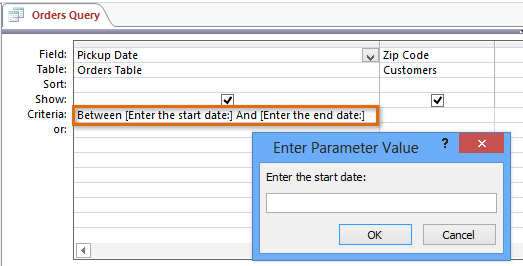 Our variable criteria may look like this: Between [Enter the begin date:] And [Enter the end date:]. These two prompts will show up when you run the question.